Summer Fridays are here, so we are bringing you the best ways to make the most of your summer days. Let yourself unwind, relax and get pampered in the city's hottest spots without breaking your summer Moët budget. In 2015, the famed Los Angeles Makeup & Beauty Lounge expanded, opening its doors in New York City in Le Parker Meridien Hotel (119 West 56th Street). The premier makeup service destination lounge transforms the professional makeup experience from a special occasion luxury to an everyday necessity that's both affordable and convenient, all in a fun atmosphere. Their expert makeup artists provide a wide range of services (including eyelash extensions, faux lash applications, brow maintenance, and more) and looks that are ideal for a night out, bridal makeup parties, showers, bachelorette parties or something a bit more natural for your everyday life. Also offering makeup artist classes, you’ll learn from the makeup pros on how to apply makeup so you can experience the Blushington way every day. And now, with their Blush On The Go service, a Blushington makeup artist can travel to your home or office at your convenience. Faux Lash Fridays – Every Friday through Labor Day weekend, receive a complimentary faux lash application (valued at $22) with the purchase of any Full Face makeup application. Choose from individual or strip lashes to enhance and define eyes. The Peel Bar Beauty Rx by Dr. Schultz & Blushington’s “Bon Voyage Lovelies” Peel – Now through September 5th, bring in your boarding pass within 21 days of travel to revive tired, dehydrated airplane skin. Enjoy Dr. Schultz’s famed Beauty Rx 40% glycolic professional peel in just 2 minutes without any irritation, downtime or cost of a doctor’s visit. Normally $225 at Dr. Schultz’s office and only $50 at Blushington, if you take advantage of this promotion, you’ll receive another $20 off for a total cost of only $30 for gorgeous, glowing skin. *Boarding pass applicable for one-time discount. 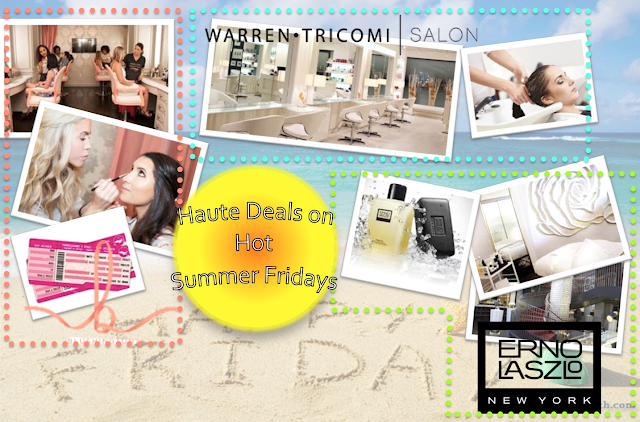 Treat your hair to the extra love it needs this summer at Warren-Tricomi. Master colorist Joel Warren and master stylist Edward Tricomi are authorities in the world of hair with their unrivaled expertise setting trends and defining beauty across the globe. Joel’s talent for customized hair color and Edward’s high precision dry cuts make the Warren-Tricomi Salons a top beauty destination in New York City. Complimentary Deep Conditioning Treatment – On Fridays now through Labor Day weekend, enjoy a complimentary deep conditioning treatment with any haircut or color, across all salon locations. Call or book online and mention ABPRxWT to secure your appointment. Buy One, Get One: Now you can take your favorite products home with the salon’s new buy one, get one promotion. On Fridays now through Labor Day weekend, purchase any Warren-Tricomi product and receive another Warren-Tricomi product of your choice on us. Drawing on nearly 90 years of expertise to create unparalleled results, The Institute provides customized skin assessments and facials that are unique to every client’s needs. Rather than selecting from a menu of services, treatments are expertly tailored for precise results. Nestled in the heart of New York City’s SoHo neighborhood (382 West Broadway), The Institute is the manifestation of expertise, attention to detail and the best in individualized attention. Each facial treatment starts with a thorough skin analysis, followed by Erno Laszlo’s multi-step deep cleansing system with a combination of anti-aging facial massage techniques, collagen boosting serums and advanced technology treatments. Curated from knowledge and observation, the experience utilizes a variety of therapies that include Medical-Grade Microdermabrasion, Oxygen Treatments and Light Therapy.